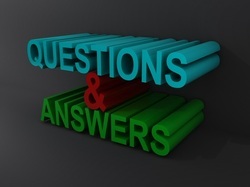 Question: In discussions about street rods, the topic of spark plug temperatures often comes up. What are some of the more important factors that affect spark plug tip or insulator tip temperature and how do these factors affect the temperature? Answer: Spark plug temperatures (called insulator tip tempertures) can be affected by five major factors. These include the ignition timing, the coolant temperature, the octane of the fuel, the speed of the engine, and the air-fuel ratio. 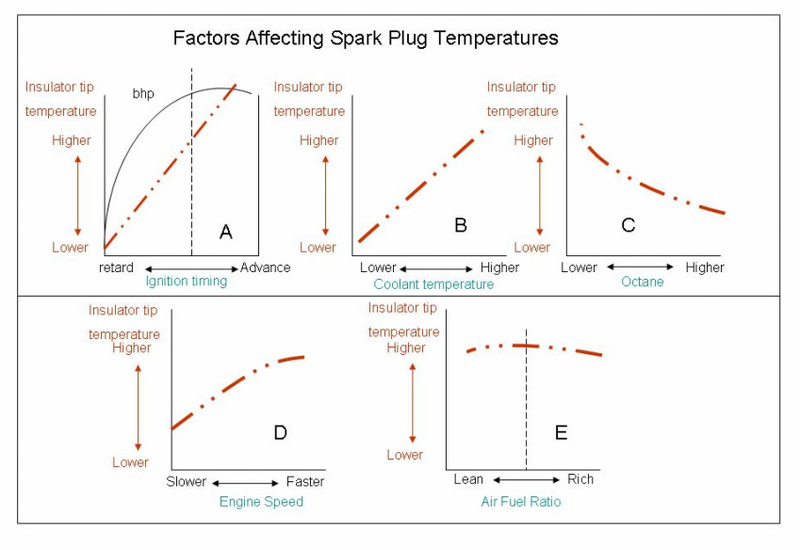 Referring to the illustration below, there are five graphs, A, B, C, D, and E. Each graph represents one of the factors that affect spark plug insulator tip temperature. Graph A show that as the ignition timing is advanced, the insulator tip temperatures increase. Graph B shows that as coolant temperatures increase, insulator tip temperatures also increase. Graph C shows that as the octane of the fuel used increases, the insulator tip temperatures decrease. Graph D shows that as the speed of the engine increases, the insulator tip temperatures also increase. Graph E shows that if the air-fuel ratio is lean or rich, insulator tip temperatures decrease. The insulator tip temperature is important for two reasons. If the insulator tip temperature gets too hot, preignition and pinging may occur. This may cause damage to the top of the piston, the spark plugs, and to the valves. If the insulator tip temperature is too low or cold, carbon may build up in the combustion chamber and cause the combustion to misfire or foul out. Both conditions will reduce the operating efficiency of the engine. The spark plug insulator temperatures can also be controlled by changing the spark plug heat range Spark plugs can be purchased that have a certain heat range, from a colder operating plug, to a hotter operating plug. Refer to the illustration to the left. On all spark plug designs, heat is transferred through insulator tip to the metal casing, and finally to the cylinder head and coolant. The amount of contact between the insulator tip and the metal casing determines the colder or hotter type spark plugs. On the hot plug design, only a small area of the insulator tip is contacting the metal casing (as shown by the number of red arrows). Therefore, less heat is transferred out to the cylinder head. 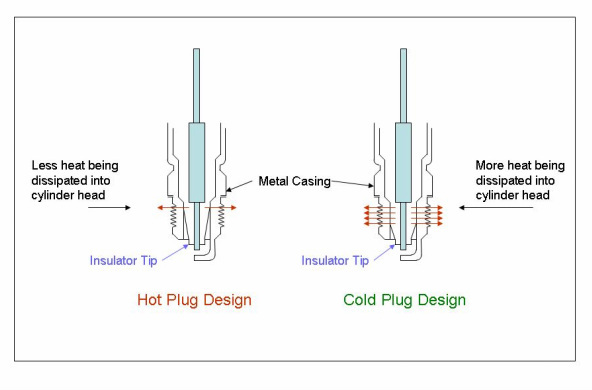 On a colder spark plug design, more area of the insulator tip is contacting the metal casing. This allows more heat to be transferred out to the cylinder head and coolant (as shown by the increased number of arrows).